The official Labour and Birth Doula training for Douglas College, in New Westminster British Columbia. Doula Canada is pleased to be partnering with Douglas College to bring quality doula training to BC that focusses on perinatal care in Canada. The two-day Douglas College doula training workshop is the first step toward certification with Doula Canada. Students who attend the Douglas College session will be considered “Trained Doulas,” but not in a certification stream. Fees are paid directly to Douglas College at the time of registration for their upcoming training dates. 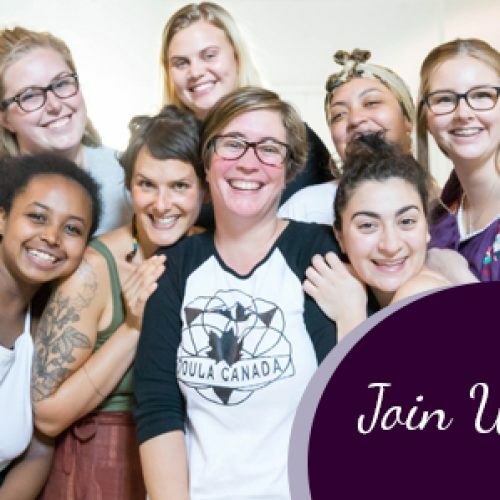 Registrants who complete the two day training may then choose to move forward with certification and can apply for membership and certifcation with Doula Canada. All fees are Non-refundable. Please read our cancellation policy prior to registering. Hello Ladies, I received a beautiful bracelet in the mail from Doula Canada. I don't know who sent it or why I received it or who to say thank you to :) But I love it. I have been admiring the bracelets that you can put essential oils on, thinking I won't find the extra money to buy myself something I don't need and being able to justify the purchase. So it kind of means a great deal, as small as the gesture was. So thank you. I want to take a moment to tell you that I had no idea what I really was getting into when I signed up to be certified with Doula Canada. Its been a welcoming change in my life and I have only just scratched the surface. I was working in a Nursing Home and have worked quite a bit with palliative care for about 10 years. I loved my job but it was hard! Physically and mentally. So I quit to be with my own tiny babes. But I've felt lost. My babes are grown and I have been wanting to do something meaningful again, but not just any job to make money. I stumbled across this program and I am love. I like helping people and I am feeling a huge pull towards the Infant lose program. I wanted to be certified as a Doula first then dive into the Infant lose program. Its a horrible thing for someone to go through, I want to help them get through that time. Thank you for being such supportive instructors. I have joined an amazing network of women!